Smoke Alarms save lives…but, only if they are in working order. Smoke alarms, just like any other electronic device, can wear out or fail. Regular maintenance is important. You don’t want to discover AFTER a major fire that your alarm doesn’t work. By then it is too late. Statistics show that a functioning smoke alarm can mean the difference between life and death for your family. In Alberta, close to 90 percent of residential fire deaths occur in homes without smoke alarms or where the smoke alarm fails to operate. Properly installed and maintained smoke alarms can alert you to the early stages of a fire, when safe evacuation is still possible. There are two types of smoke alarms — photoelectric and ionization. Both types are suitable for home fire protection. The location is also important; there should be at least one on every level. Fire presents the greatest threat at night when everyone is asleep. If your home has sleeping areas located on more than one floor, or separated by other rooms, a smoke alarm should be installed outside each area. Test your smoke alarm monthly to make sure it is performing correctly. Test on the first day of the month, or a pay day or some other significant day you may have in the month. Mark it on your calendar to remind you. Check for two things while you are testing. ; ensure that power is being transmitted to the alarm and that it will activate when smoke is present. Test the alarm by holding a candle (that has just been blown out) to it. The smoke should cause the alarm to sound in 20 seconds. Fan the smoke away to silence the alarm. 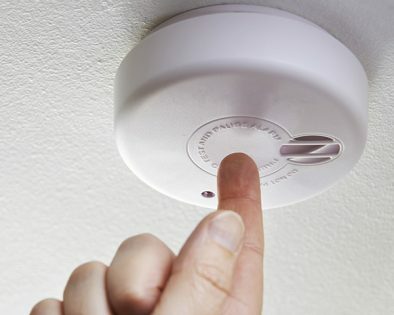 Battery operated smoke alarms will make chirping noises to let you know when the batteries need replacing. This should be done on a yearly basis. When the alarm sounds, you don’t have time to formulate a plan of escape. If you don’t know instinctively what to do, there is a danger that you won’t make it out safely, especially, if the alarm awakens you out of a sound sleep. Draw a floor plan of your home and prepare a fire escape plan with your family. Plan two ways out of every bedroom usually a door and a window. Close doors behind you to slow down the spread of the fire. Get out and stay out. Set up a meeting place, a safe distance from the building. This way you can check that everyone in your home has gotten out safely. Call the fire department from a neighbour’s house. Keeping your alarm clean is also important. Dirt and dust inside can confuse the mechanism and lead to a false alarm or cause a malfunction. Take a few minutes to clean out your alarm every six months. Your manual should contain detailed instructions.